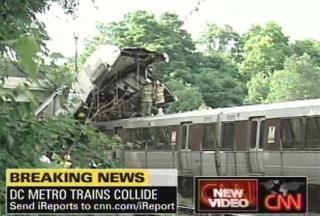 (Newser) – At least six are dead and 70 others injured after two subway trains collided during rush hour this evening in Washington DC, the AP reports. The incident is “developing into a mass casualty event,” a Metro spokesman told WJLA-TV. “We’re expecting a number of injuries.” A train on the Red Line, the system’s busiest, plowed into another train stopped at a station, Metro's general manager said at a press conference. Horrible :( Thoughts are with all involved. I used to ride that train all the time. Unfortunate.